In “Tree of life.” Terrence Malick goes back to his Waco, Texas, upbringing to explore the struggle between Grace and Nature, with his mother and father respectively representing the two sides. Unfortunately, the film also includes quite a bit of navel-gazing and a touch of dinosaurs, for good measure. Sean Penn's role as Jack, a seemingly successful man with a beautiful house and a beautiful wife, is quite small, though his younger self is at the center of the action. Grown-up Jack is still struggling with his childhood and the long-ago death of one of his two brothers. Despite living in a giant glass box of a house and working in huge skyscrapers, he feels claustrophobic, whispering at one point, "I just feel like I'm bumping into walls." The film is primarily flashbacks of his childhood, and the (mostly) silent tug of war between his parents, played beautifully by Brad Pitt and Jessica Chastain. 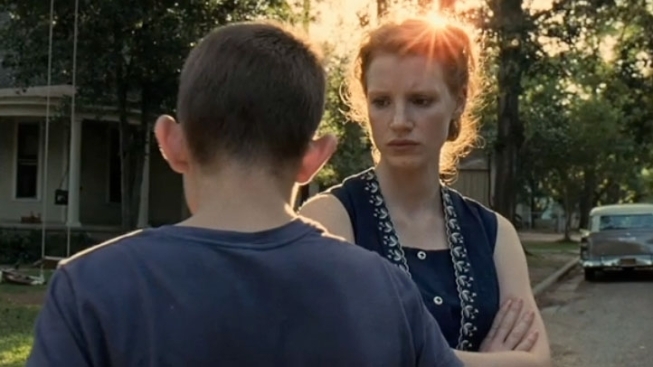 As with all of Malick’s films, “Tree of Life” is a feast for the eyes. His sense of light, composition, perspective… It’s gorgeous. You could randomly stop the film and have a 75% chance of landing on a frame you would happily hang on your wall. But there’s no real narrative structure to the film; it meanders through Jack’s memories of growing up. Just when you think you’ve got a story on your hands, we watch meteors crash into the Earth’s surface or watch microscopic life forms smash into each other or witness a showdown between two dinosaurs. It’s all stunning to behold—save the prehistoric beats—but it doesn’t move the story. Yes, it comments slightly on the story—notice how much some of those microbes resemble Dad’s drawings—but the tangent is long, so disjointed from everything else, that we lose the thread. Pitt’s Mr. O’Brien is a capriciously cruel Darwinian (“You wanna succeed, you can’t be too good”) taskmaster, with whom every meal is a minefield, his eagle eyes on your elbows, posture, smile, and language. But for such a hard case, he’s also remarkably introspective and affectionate. And for all the angst Malick’s real-life father may have caused him (“Always you wrestle inside me”), the director makes clear that his father gave him the courage to be a filmmaker. Pitt delicately maintains a low simmer throughout, leaving you unsure if he’s ready to explode or console. Chastain, in sharp contrast, is strong-willed luminescent beauty, a woman of such composure, love and kindness that you wonder how it is she came to meet, much less marry, Mr. O’Brien. Watching Chastain on the screen, it’s easy to see why in just two years she’s gone from nobody to Next Big Thing, scoring roles in films with the likes of Malick, Sam Worthington, Michael Shannon, Al Pacino, Ralph Fiennes and Tom Hardy. Yes, she’s beautiful, but not in your bland starlet way. She has about her a depth and gravitas that allows her to go toe-to-toe with Pitt while Malick looks on. Hunter McCracken as young Jack is the film's real surprise, though. His angry eyes, giant flap-down ears and ground-kicking frustration perfectly evoke the angst specific to pre-adolescence. With all its visual splendor and jagged storytelling, “Tree of Life” feels more like a video art installation than what we commonly think of as a movie. It’s also a deeply personal film, almost to the point of shutting you out, as if Malick can’t find the precise words to share with you what he’s feeling. "Tree of Life" made its world premiere yesterday at the Cannes Film Festival; it goes into limited release Friday May 27.